Homeowners Anne and Patrick Jordan’s ambitious upgrade and extension project in County Kildare took the shell of an 18th century farmhouse and transformed it into an elegant family home with a striking-yet-sensitive modern extension — all while embracing a healthy and fabric-first approach to retrofit combined with clever heating system design that has brought them from a G to an A3 rating. You can’t see it when you turn off the main road and start driving down the short but narrow gravel pathway, but once past the forest of trees that hide this newly renovated 18th century farmhouse from general view, its tall four-storey structure reveals itself dramatically. As first impressions go, it looks great. It’s far more understated than you might expect a building like this to be — you might even describe it as minimalist, with its simple and subtle finishes. Pebble-dash may be out of fashion, but this building has an unpainted period roughcast finish that looks just right. The traditional white sliding sash front windows are beautifully painted and elegant, while everything else, including the front porch, the steps and the landscaping are all finished in the same subtle but tasteful theme. But you’re also looking at a historic building that has been retrofitted to a building energy rating of A3, a spectacular achievement in anyone’s book. After all, there are a whole range of challenges involved in trying to undertake a deep energy retrofit on a building like this — and some building conservation experts would argue that you shouldn’t even try to. So, how did the team behind the project — which included Maxwell Pierce Architects, Mesh Architects, and leading low energy builder Pat Doran Construction — manage to do it? Part of the answer comes as the driveway sweeps to the far left side of the house, where a large, ultra-modern and multi-angled extension at the back gradually comes into view over the long and high rubble wall that fences off the rear of the property. 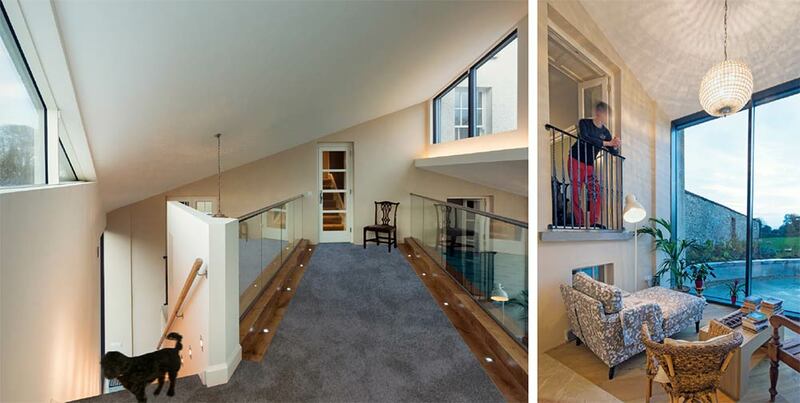 It’s not the type of modern extension that is common on other historic buildings, which often feature a glassy tunnel-type link connecting the old building with what is essentially a brand new structure. This is a proper extension — it’s all of one piece. (above) The house is ventilated via Lunos decentralised mechanical ventilation systems with heat recovery. Looking at the technical specs, it’s clear the new extension could probably achieve passive house certification on its own with its passive slab foundations, triple-glazed windows, airtightness, and a highly angled design and orientation that seeks to maximise solar gain. But while it turns out that a high BER rating was achievable for the whole building, striving for passive house certification would have made no sense because of the physical marriage between a modern high-performance extension envelope and an old-style, solid masonry, minimally insulated structure with traditional sash windows and a four-storey construction that is just one room deep, resulting in all the main rooms having three or four external walls (meaning there is a high surface-to-volume area from which heat can escape). Architect Bill Maxwell of Enniskillen-based Maxwell Pierce has worked on plenty of historic buildings with extensions, but making such dwellings work as single, seamless entities from an energy and comfort point of view can be difficult — unless you also have the opportunity to strip the older building back to its bare bones and start again from scratch, as was the case here. If this is not possible, he actively discourages adding modern extensions to historic buildings because of the propensity of the older buildings to devour heat. If the homeowners cannot make serious improvements to insulation and airtightness in the original building, they will have to continue spending huge amounts just to keep the temperature of the old, leaky house somewhere near that of the new, well-insulated extension. But what added a further difficulty to the deep retrofit of this particular near-300 year-old building was the zeal with which Kildare County Council required homeowners Patrick and Anne Jordan to preserve as far as possible its essential character and salvageable features. It turns out the local authority is more active in this regard compared with many others around the country, because so few historic buildings of any kind remain in the county. When Patrick and Anne Jordan first spotted the house in 2009 (the couple and their five children were living just a few hundred yards away), it was in a bit of a mess, having been abandoned by its elderly owner a few years previously, and subsequently subjected to a period of continuous vandalism by students from a nearby secondary school before the windows were blocked up and the property made reasonably secure. The couple bought the house and sat on it for a while before investigating the possibility of renovating it and adding a glassy extension. The house already had an ugly rear extension made out of pre-cast concrete that was grafted on in the 1920s, providing a plumbed toilet, kitchen and utility. To this end, they consulted with a number of different architects, including one who had close links to Kildare County Council, and who persuaded them that the original structure was definitely worth preserving. But when they went to hire her services, she was all booked up — much to their disappointment. So they decided to knock the whole edifice down in favour of a new house of similar character. Although the couple conceded to KCC’s demand that they go back to their original plan to preserve and extend, Anne doesn’t hide her exasperation at the exacting and sometimes tedious demands of the building conservation procedure that followed, which included continuous consultations with the local authority as the project rolled along. (Above) the house is heated by an Ochsner 18kW air source heat pump, with features a separate horizontal split evaporator that sits outside the house. The system includes an 800 litre buffer tank and a 300 litre hot water cylinder with exhaust heat recovery from the bathrooms. 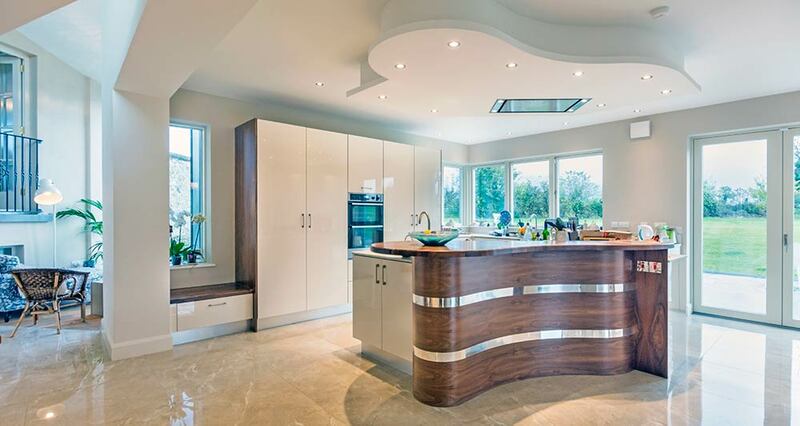 Heat is distributed via underfloor heating circuits throughout all three floors of the house. “We were told this house had to be tended to carefully, and that it needed a grade one architect, which is a load of whallop because it’s just a farmhouse, it’s not government buildings…Conservation is important, but we were trying to embrace new ways as well,” she added. Sunni Goodson — an architectural conservation specialist with grade one architects Mesh — was appointed to be the main intermediary between the Jordans and the council. She readily concedes that the house is not a protected structure and that much of its historic fabric had been compromised, but says it was “still just a gem of a house”. “The vaulted brick ceiling at basement level and a portion of the original staircase survived, as well as floor structures, chimney breasts and the 19th century front porch,” she said. 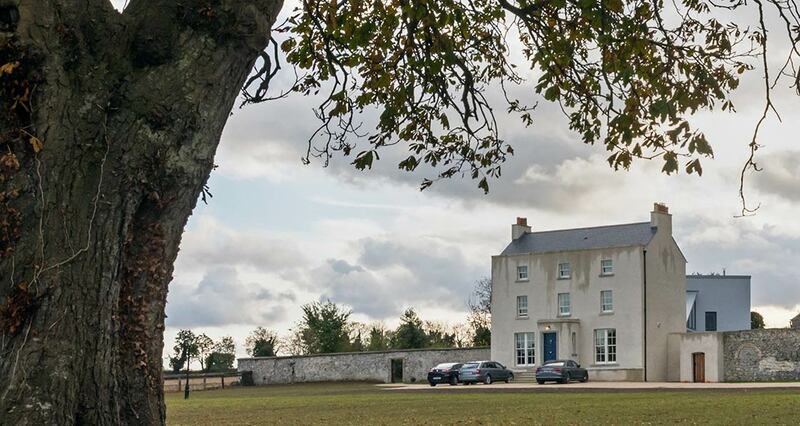 Before Kildare County Council intervened, the Jordans had hired Bill Maxwell to oversee a new build project, but his historic building experience would make him an even better choice when it became clear that a complete new build wasn’t going to happen. 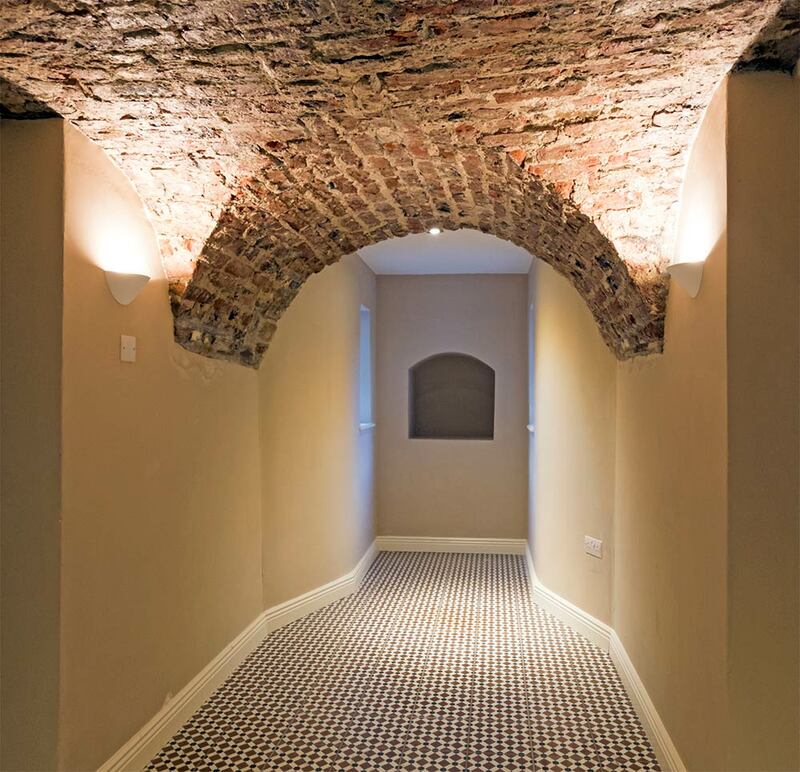 “One of the biggest challenges was getting an underfloor heating system into the fabric of the existing old building without completely destroying the historic fabric,” said Maxwell. Apparently this caused more than a few issues — joists were too narrow for the relevant pipes and had to be adjusted, and there were parts of the floor where joists needed steel reinforcements, lest the pipes should break because of excess movement. It also meant that the Jordans could have the modern heating technology that they wanted. The system they chose is based on underfloor heating all throughout, driven by an Ochsner 18kW air source heat pump that features a separate horizontal split evaporator that sits outside the house. From a distance it looks like a large DJ twin turntable, and it was designed by Monaghan-based firm Eurotech in conjunction with Ochsner, with a view to taking advantage of the mild humid Irish climate. It boasts a co-efficient of performance of over 400%. One advantage of a horizontally mounted evaporator, according to Eurotech’s Gerry Duffy, is that at times of higher humidity, any excess water generated just runs off the table and onto the ground. “Using floor heating in the existing structure allowed us design a system with very low-flow temperatures which is critical in dealing with old fabrics and heritage structures,” said Duffy. The system, which includes an 800 litre buffer tank and a 300 litre hot water cylinder with exhaust heat recovery from the bathrooms, is designed to ensure that the base temperature of the house never falls below 16C. The Eurosmart system has room-by-room heating controls, and features smart sensors that learn how each part of the building behaves (with their differences in building fabric, insulation, orientation etc) and adjusts the input of heat accordingly to achieve a consistent temperature throughout the building. Meanwhile, ventilation duties for both the new and old buildings are courtesy of a decentralised Lunos heat recovery ventilation system – a solution that enables low energy ventilation without running ductwork. The large house requires a dozen Lunos E2 decentralised heat recovery ventilation units, a Lunos Ego HRV unit and thee low energy extract fans. Although the Jordans are only in the house a matter of weeks, Anne is delighted with the comfort levels throughout — particularly as the bedrooms of her five children are all in the old part of the building. 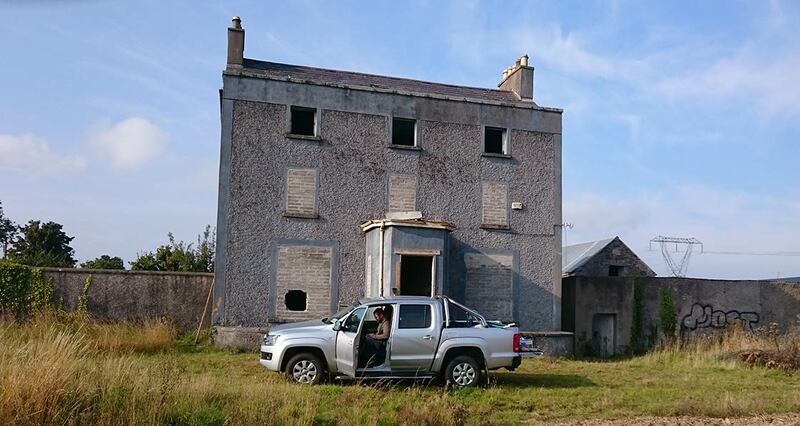 Gerry Duffy estimates heating bills will amount to €700 a year for this 400 square metre property, which will be hugely impressive if he is proved right. Of course, the upgrade to the fabric of the old building — and the new high performance cavity wallextension — are both vital for keeping energy costs down too. The old rubble limestone walls are thick but fairly porous, so it was essential to insulate them in a sensitive manner, using products that allowed them to “breathe” — in other words, that allow water vapour to pass through unimpeded. The shell of the old house that the Jordans purchased prior to the retrofit; a vaulted brick ceiling is one of the original architectural features incorporated into the renovated property. “Fortunately there are wonderful new products on the market which can be used in a historic context, such as Gutex and Calsitherm, depending on the wall construction material and external finish. They are breathable products that significantly increase the building’s thermal efficiency and the occupants’ comfort, but they can also be finished with lime plaster,” said Sunni Goodson. The exact choice of insulation materials was determined by an analysis carried out by Joseph Little of the Building Life Consultancy. The 600mm-thick rubble walls were all boarded internally with 40mm of Gutex Thermoroom, with internal lime plaster as an airtight layer (the roofing throughout the building features Pro Clima membranes for airtightness and vapour diffusion). 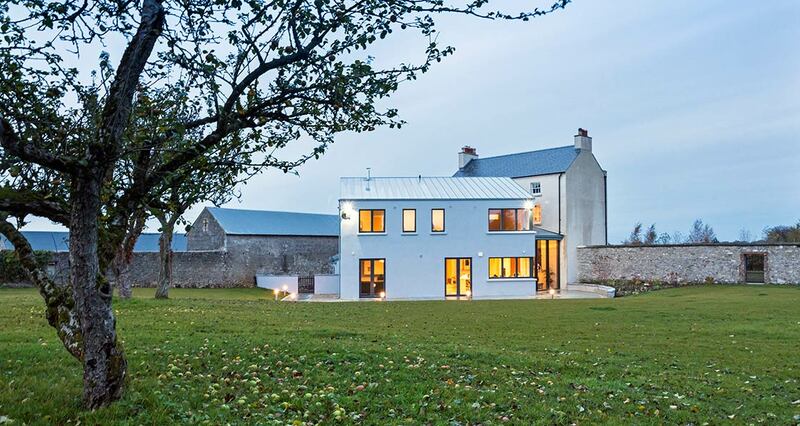 The whole house scored an airtightness result of 1.3 air changes per hour — an exceptional result for such an old dwelling, and such a complex project. The work of project manager and contractor Paul Doran and his father Pat (both of Pat Doran Construction), was clearly crucial in meeting such remarkable levels, particularly when faced with the prospect of a building that Maxwell described as “an awful looking kind of haunted house ruin of a thing” — and making it airtight. Paul Doran said: “I think we did things the right way. We were very lucky in that the architect was committed and the quantity surveyor [Michael Broe] took a big interest and put a lot of time and effort and energy into it. 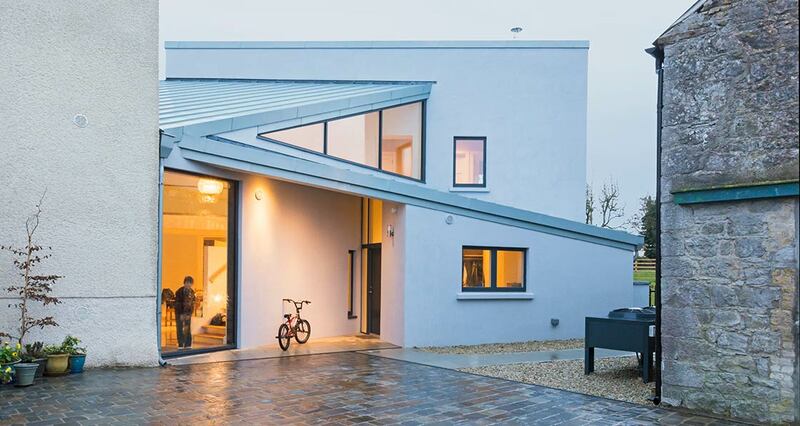 And Anne put in an enormous amount into the project every day.” The Dorans were undoubtedly helped by their experience on other challenging projects, drawing from a well of experience picked up on certified passive house and Enerphit projects, including a complex retrofit on Zion Road, Rathgar featured in issue 12 of Passive House Plus. As part of the conservation tick-box, the sliding sash windows of course had to stay, although most were replaced. The Jordans were keen on double-glazed sash windows, but these would not fit into the narrow depth of the historic glazing bars. An expensive solution was Slimlite glazing, which is essentially two panes of glass held very close together. 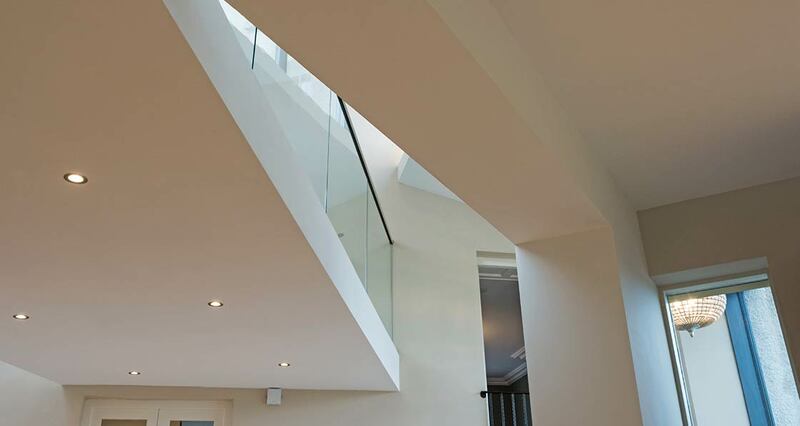 This is also the reason the extension is angled at around 45 degrees to the old building, which gives the light-filled space inside, including the kitchen and the mezzanine gallery above it, a peculiar triangular shape that works very well. You can also see the back of the old house very clearly from here too. On the cold-but-sunny morning I visit, it feels nicely warm everywhere in this house, without a hint of stuffiness. It’s something that clearly delights Anne and her family and allows them to enjoy the old and the new in equal measure, because it’s all been done so well. “What’s actually rewarding about the building is the angles, because when you’re inside, no matter where you stand, there are views everywhere,” she said. If you’re in the market for a new or nearly new car and low running costs are a priority, the chances are you’ll probably plump for a diesel. However, the image of diesel has come in for a bit of a hammering in recent times thanks to concerns about its contribution to toxic air pollution in urban areas, not to mention the VW ‘dieselgate’ controversy. But even if your environmental conscience plays second fiddle to running costs, switching to a plug-in electric car could save you thousands a year if you can make it work. According to the Sustainable Energy Authority of Ireland (SEAI), based on doing the national average mileage of 16,000km a year, you would save nearly €900 a year in fuel costs over an equivalent diesel car. This calculation assumes that charging your EV over the course of a year to cover this distance would add just over €200 to your annual electricity bill, while the diesel car (56 mpg or 5L/100km) would cost nearly €1,100 a year to fuel. The cost comparison calculator on the ESB ecars website produces similar figures. The average diesel car doing 23,000km a year would cost €1,800 a year to fuel, while the EV would merely inflate your electricity bill by just €300. Add to this cheap tax and the likelihood of lower servicing costs for an EV because there are few moving parts to worry about. Needless to say, pure EVs won’t suit everyone,. However, huge improvements in battery range, the number of public charging points as well as model availability has seen the Irish EV population grow faster in the last three years, albeit from a low base. There are now 1,200 charging points around the country, and given the still tiny numbers of EVs around, there have been relatively few reports of difficulties in accessing them. While the sales trend is upwards, it’s still steady rather than dramatic, according to figures from the Society of the Motor Industry (SIMI). So far this year, 434 (298 electric, 136 plug-in hybrids) have been sold, which seems well on track to beat last year’s figure of 690 (392 electric, 298 plug-in hybrids). There are also many more makes and models now available. While the Nissan Leaf is by some way the most popular EV, you can also choose from cars like the Renault Zoe, BMW i3, Hyundai Ioniq, VW e-Golf, and Audi e-tron A3. There’s even a people carrier in the form of the Nissan E-NV200. Mind you, you’ll need deep pockets for those. A Model S saloon will set you back over €80,000, while prices for the new Model X SUV arriving this year will start at over €110k. Indeed, even the more open-minded motorists among us are likely to have been put off by the high prices of electric cars relative to comparable petrol or diesel versions, even with the SEAI grant and VRT rebate that electric cars qualify for. For instance, the full price of a VW e-Golf is nearly €45,000, but thanks to the SEAI electric car grant of €5,000 along with a further €5,000 in VRT relief, the on-the-road price is slashed to just over €35,000. 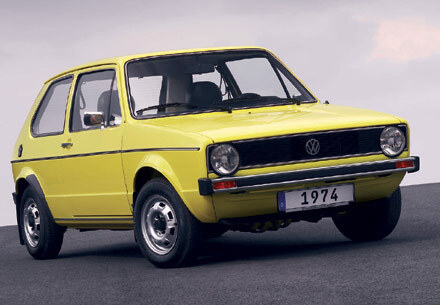 However, even the highest-spec diesel Golfs are priced at just over €30,000. But if the trade-off between the higher upfront cost and the long-term savings in running costs seems reasonable, how do the economics of running a pure electric car stack up in the real world? We got in touch with a number of members of the Irish Electric Vehicle Owners Association (IEVOA) to ask them how the sums were working out for them. Contrary to the popular perception that current EVs only make sense for shorter journeys, not only are many doing quite high mileages with the help of the public charging infrastructure, their pockets are considerably better off. Many reported they had been previously spending anything up to €250 a month on fuel but are instead now paying up to €40 a month extra on their electricity bill (and often less if they used free public charging points). Dave McCabe, an committee member of the IEVOA, which has 800 owners in its Facebook group, says the vast majority of owners seem to be happy with their decision to switch to EVs. ESB ecars, the division responsible for rolling out and maintaining the public charging points network, did propose to introduce charges late in 2015 only to postpone the decision following a bit of an uproar, and followed by talks with the Commission for Energy Regulation. Customers would have been charged €16.99 a month for unlimited access to low-speed one-phase charging points nationally along with a extra 30c a minute if you use one of the fast charging points. Denis O’Leary, head of smart energy technologies at ESB, says charging will be introduced “at some point in time”, although what those charges would be is the subject of a consultation and review by the Commission for Energy Regulation (CER) that is due to be completed shortly. However, Declan Meally, head of emerging sectors at the SEAI, says that even when charging is introduced, it is unlikely to affect the running costs for the estimated 90-95pc of owners who charge their EVs at home. He adds that the Government may consider a range of further incentives to boost EV take-up. But there is also a concern over the higher long-term depreciation of EVs compared to conventional cars. Analysis by car-history -checking website MotorCheck, which monitors the residual values of the car market for banks and manufacturers in Ireland, shows that the average ‘C Segment’ car (Ford Focus, VW Golf) will be worth 42pc-47pc of its value over three years with an average mileage, while EVs are averaging between 28pc-34pc. “One of the issues affecting the used values of EVs is that the technology is still pretty much in its infancy, and that means it is moving forward at a fast pace, with the result is that an EV purchased today could be obsolete in terms of technology within two or three years,” says MotorCheck managing director Michael Rochford. These factors didn’t stop John and Lisa Carey from Dublin from opting for a new Nissan Leaf (a 30kwh version) last year, and they later replaced their second car with a second-hand 2011 Leaf (24kwh version). John Carey, who does about 20,000km a year, calculated that the total cost of ownership of the new Leaf over the first five years – including finance, electricity, tax, insurance and servicing – worked out at €7,500 compared to €9,050 for a comparable diesel car (in this case a Ford Ecosport). But it was the total per annum cost after five years (once the car was paid off) that is the biggest eye-opener, with the Leaf working out at €1,030 a year to run vs €3,470 a year for the Ford. The difference, besides the fuel vs electricity costs, is the cheaper motor tax of the Leaf and the assumption that the Ford is more expensive to service as it gets older (fewer moving parts in an EV, or so the argument goes). Carey’s 161 Leaf has a realistic range of 160km, while the older 2011 Leaf can do about 90km, which he says “is perfect for a local runabout with occasional airport runs, etc, while 160km can get me anywhere in the country with only one 30-minute stop, which is good enough for me as I would like a break by then anyway”. Carey said they did wonder before buying the new car if they should hang on until battery ranges improved. (The Nissan Leaf’s claimed range is 250km, but many owners also urge would-be buyers to take manufacturers’ range claims with a large pinch of salt). He’s also not concerned about depreciation because they tend to hang onto their cars rather than trade them in every few years. However, the higher levels of depreciation of EVs, including in Britain, have allowed others to get into nearly new EVs for a lot less than they would have paid new. Last August, Pat Rabbitte from Ballyhaunis, Co Mayo imported a 2014 Nissan Leaf from England for the all-in cost of €9,300. Furthermore, he was spending €160 a month for diesel on his previous Ford Fiesta, and now estimates that he has saved nearly €1,300 in just over seven months of owning and driving the Leaf to work in Galway. In 1901, when Cornelius Geary was filling out the census form for that year, he wrote the words ‘deaf and dumb’ next to his name among the details of his family household on Harpur’s Lane in Cork city. It’s clear that the 56-year old fisherman and coal porter had filled in the form because, as well as being the only deaf person in his family of three, he was the only one who could read and write. But little did he know how significant his census entry would be some 115 years later to his great, great grandson, Calum Geary, and his parents, Andrew and Helen. They also found out shortly afterwards that Cornelius attended the famous St Joseph’s School for Deaf Boys in Cabra, Dublin. Andrew says Calum is “so happy” to know that there was a deaf person in his family. But it’s clear that his great, great grandfather has already become a role model, not least because Calum could attend the same school (now called the Holy Family School for the Deaf) at secondary level in a few years time. But his father openly worries about whether his son will grow up to be as literate as his ancestor. The story of Calum and his family and the journey they have so far taken together to try and ensure that he has the same access to opportunity as his three siblings is fascinating and inspiring. But it also highlights starkly a number of long-standing issues regarding the status, use and teaching of Irish Sign Language. Calum, 8, has two older brothers, Matthew and Barry, but also an identical twin brother, Donnacha. The family live in Ballyhooley in north Cork, where Donnacha, Matthew and Barry attend local schools, while Calum travels 80km a day by taxi to and from St Columba’s National School with Facility for Deaf Children in Douglas. 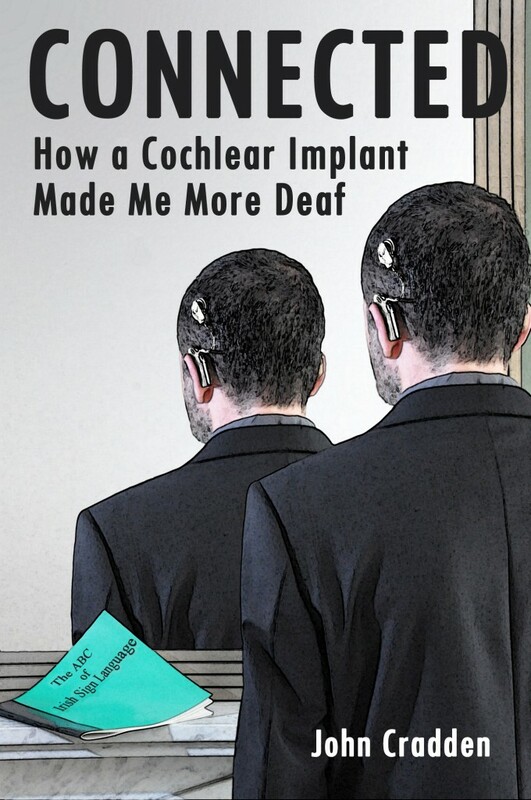 Calum was born with Cochlear Nerve Aplasia, which means he is without the vital auditory nerves that transmit sound information from his middle ear to his brain. When he was three, his parents got him selected for a rare procedure in the UK called an auditory brainstem implant, but it didn’t work as anticipated. This makes him one of a handful of deaf children in Ireland who cannot benefit from any kind of cochlear implant or hearing aid technology. So naturally the family switched their focus squarely to learning Irish Sign Language (ISL). ISL, like other sign languages such as British Sign Language, American Sign Language or French Sign Language, has its own complex linguistic structure, grammar, rules and features. It takes years to reach anything approaching full fluency in any language, and while Helen’s signing today is competent, Andrew admits he is struggling a little because shift work as a Garda sergeant prevents him from attending as many ISL classes as he would like or even being at home when the family’s ISL home tutor calls over. But by the time he reached first class in St Columbas, it became clear to Andrew and Helen that Calum was falling behind his twin brother in terms of literacy. A couple of years before that, Andrew had come across a book by Dr Marc Marschark, a US professor and well-known deaf education expert, called “Raising and Educating a Deaf Child”, which espoused the ‘quality and quantity’ model of language acquisition. The theory is that to acquire any language, whether it’s a signed or spoken language, children must have exposure to the highest quality and quantity of language input “via meaningful interactions with others who are already capable users of the language”. With that, Andrew had realised that although they were very happy with Calum’s teachers and that they had learnt some sign language, their competency in the language not at a high enough level to be a strong ISL model for him. In the absence of what he felt was any clear effort to implement a key recommendation in the NCSE policy paper, which is that teachers in specialist settings should have a “minimum standard of competence in the use and teaching of ISL” (although it doesn’t specify to what level), Andrew decided to lobby for an interim solution: to make an application to the Department of Education and Skills (DES) for a grant for the school to employ a qualified ISL classroom interpreter with a QQI Level 8 qualification – a degree. He acknowledges while that a lot of teachers of the deaf have specialist qualifications, for Calum “to reach his academic potential he needs someone that’s at one with Irish Sign Language, and luckily enough there were people in the Department who understood that”. When he got the school and the local SENO (Special Educational Needs Organiser) on board, he put together a document as part of their application that was peppered with relevant references to national and international academic research on a whole range of areas linked to deaf education, as well as the NCSE policy advice paper. In his document, he noted that the work done by the Trinity College Centre for Deaf Studies over the last 15 years had produced a body of graduates with a Level 8 qualification in ISL who specialise in either teaching or interpreting. “Every sign-dependent Deaf child should have access to one of these graduates to support their access to the curriculum,” he wrote. All the same, Andrew still had the uneasy sense that the DES would reject their application, so they engaged in a round of political and media lobbying with the help of the Irish Deaf Society and the Cork Deaf Association over a number of weeks before finally “the letter came in the post, one Monday morning to the school”. Andrew and Helen are not by any means the first set of parents who sought to compel the State to fulfil its obligations to provide an education through fluent ISL. During the mid to late noughties, a number of parents had taken the Department of Education to the High Court and the Equality Tribunal. We understand, however, that the outcome of one court settlement was that two teachers from the Cabra deaf schools would be given time off to upskill in ISL at the TCD Centre for Deaf Studies. According to the Centre’s director, Lorraine Leeson, the outcome of another case taken by the Equality Tribunal was an agreement that the DES would put out a call to tender for a postgraduate diploma for teachers of the deaf to upskill, particularly in relation to ISL competency. The centre submitted a proposal, won the tender and began work on a programme, only for the DES to later withdraw their commitment on economic grounds. “So the PG Diploma/ Masters went on ice, but we are always open to thawing it out and revisiting it,” she said. At this point, there had been no opportunity for a number of years for teachers of the deaf to obtain specialist qualifications in deaf education within Ireland. UCD had run a teacher of the deaf postgraduate diploma course for many years but this was closed down in 2002 due to the lack of numbers applying. There is also no formal requirement on teachers who teach deaf children in specialist settings to have a teacher of the deaf qualification – although most apparently do at this stage. This is a standard requirement in the UK. But rather than commit to developing postgraduate programmes for teachers of the deaf at an institution like TCD, the only option offered by the DES to younger teachers of the deaf was to acquire their specialist qualifications at the University of Birmingham or the University of Manchester by distance learning and occasional trips to the campuses for lectures. All four teachers at the Midwest School for the Deaf in Limerick (which only opened in 2001) have trained in Birmingham, while “a large number” of the younger teachers at the Holy Family School have done the same. Many have questioned the logic of this on pure economic grounds. As well as paying for flights, accommodation and other expenses, they had to pay for ISL interpreters to accompany the teachers who are deaf and fluent ISL users. But others are angry because it means that those teachers of the deaf who don’t have fluent ISL will not have gotten any opportunity to upskill to anything close to a Level 8 qualification in ISL by going to an English university. The Department of Education told us that “special schools for the deaf have been encouraged in relation to the use of sign language in class” but between 2012-2016 only five teachers from these schools availed of funding from the Special Education Support Service to improve their ISL. For advocates of ISL in education, one very positive development has been a proposal for a new Bachelor of Education Irish Sign Language entry route, which is being designed by Dr Elizabeth Mathews, a lecturer in the DCU School of Inclusive and Special Education. The idea is to provide a way into teacher education for deaf students who have been exempt from Irish, but who are fluent users of ISL. “For those deaf children using Irish Sign Language to access the curriculum, it is extremely important that those working with that child in school have a level of Irish Sign Language sufficient to allow them to communicate with, assess and teach that child. Andrew also strongly welcomes this. “What does it say to a deaf person, like Calum, that there’s no deaf teachers in his school?” At Holy Family, out of a teaching staff of 59, just six of the teachers and seven of the SNAs are deaf. The six deaf teachers are secondary teachers; there are none at primary level because of the Irish language requirement. Like Cornelius Geary, Dr Conama is an ex-boarder student of St Joseph’s School for Deaf Boys. His sign ‘name’ in ISL denotes a hearing aid, as the Roscommon man was one of the first deaf students in the country to get a hearing aid back in the 1960s. He hasn’t worn one for years, but his time at the school was firmly within the era when ‘oralism’ was the predominant approach, whereby students would be taught exclusively through listening and speaking and with the help of audio technology, and without any sign language in the classroom. Evidence in Ireland and elsewhere has emphatically proven the failure of that approach, which was only abandoned here in the early 1990s. It clearly damaged the reputation of the Cabra schools not just in the eyes of the deaf community, but also of wider society, with far too many of Dr Conama’s generation today still struggling with basic English literacy, never mind a Leaving Certificate to their name. Historians have noted with some irony the archival evidence to show that those who were educated before the 1950s, like Cornelius Geary, tended to have far better literacy than those who endured the oralism era. That conference also heard from Marc Marcshark, the US professor known for promoting the quantity and quality language model and who advised the NCSE. He said that parents and teachers’ concerns about the lack of support services for deaf children appeared to be well understood by government, but on the other hand there was a shortage of evidence-based practice taking place here. While Andrew generally supports Marschark’s overriding belief in an evidence-based approach that supports the huge diversity of needs among deaf children (many of whom have additional needs), he believes that there ought to be room for some common approaches to the teaching of deaf children who use sign, such as the creation and funding for the position of a ‘communication support worker’, similar to what they have in the UK in some schools. This role is based on that of an SNA, but would specify a minimum qualification in ISL and, naturally, Andrew thinks this should be set at QQI Level 8. The possible creation of such a role is part of the terms of reference for the NCSE’s current review of the SNA scheme, part of which involved a public consultation. In the meantime, starting last September Calum has had what he terms an ‘educational interpreter’ in his classroom, Yelena McLennon, and they’ve already noticed a big increase in his confidence. “And he has a great teacher, they’re a great team,” he adds. Helen also says she has noticed something that Dr Conama might describe as the blossoming of ‘social capital’ as a result of the new fluent ISL staff member: the other deaf children in the class, who have hearing aids, cochlear implants and other technologies, are signing more. “He’s able to play more and interact more with the children in the playground.” The teachers were very positive about it from the start as it’s making their lives easier, as are the deaf SNAs who work for the facility, she said. However, Yelena’s role is funded through a grant, so there is no guarantee he will have it forever. “Calum will have his interpreter for up to four years,” said Andrew. “What’s going to happen in 2020? Will I have to start campaigning again? Now living in a firmly bilingual household, Andrew is set to transfer to a new role with regular working hours at the Garda college in Templemore, which will allow him to devote more spare time to improving his ISL. In 2002, sensing the importance of early intervention, it opened the first pre-school specifically for deaf and hard of hearing children, and which was financed entirely by fundraising for some 13 years until the ECCE scheme and the HSE came on board. It is currently engaged in two projects that it hopes will have a lasting impact on deaf education in Ireland. The first is a curriculum for Irish Sign Language based on the Irish curriculum, which was suggested by the school’s inspector, Johnny Murphy. The school employed a teacher, Ruairi who helped to further develop it. However, Maria fully appreciates the limits of what they can do, whether it’s because of their very limited budget as a small school or the inherent flaws in the deaf education system when it comes to the teaching of Irish Sign Language. They are also not in a position yet to provide a bilingual education through ISL because of the teachers’ current proficiency levels. Technically the method they use is called Total Communication, where the teachers sign and speak at the same time. However, the school has four SNAs who are deaf and fluent ISL users who provide a critical bridge for the children who use sign as their first language. If you’re a regular viewer of shows like RTE’s Dancing with the Stars or the BBC’s Strictly Come Dancing, you might have heard about the deaf man who sensationally won the US version of the show last year. Nyle DiMarco, who had won America’s Top Model in 2015, has been using his new-found celebrity status to promote his charitable foundation, which seeks to improve access to “accurate, research-based information about early language acquisition for deaf children, specifically the bilingual education approach”. It is also a backer of a movement called Lead-K, which aims end early language deprivation among very young deaf children by encouraging US states to pass a “language acquisition milestones accountability law” to ensure that each deaf child has a language foundation based on either or both ASL and English. Three states, including California, have already passed these laws and legislators in 23 more states are aiming to do the same in 2017 and 2018. The laws require state departments of education to select benchmarks that track the language and literacy development of deaf and hard of hearing kids up to age five. 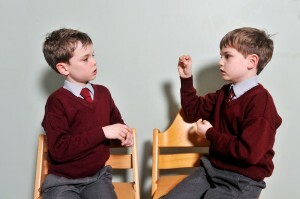 Attitudes to ASL seem to be more positive within the US education system than in Ireland. In the US, of the 76pc of deaf students who attend fully mainstream schools, 51pc use sign language interpreters. (source) This is practically unheard of here. However, unhappy at the lack of high ISL fluency among many teachers of the deaf in specialist settings, it’s understood that a number of parents here are actively considering applications for a grant to provide a fully qualified ISL interpreter for their deaf children in a fully mainstream school on the same terms as Andrew Geary did for his son Calum in Cork. It’s often assumed that when profoundly deaf children are involved in any kind of musical performance it’s mainly for their therapeutic benefit: a worthy attempt at confidence-building or something that might help with their speech development. But watching the teenagers of St Mary’s School for Deaf Girls choir perform the traditional Irish song May the Road Rise Up to Meet You in Irish Sign Language (ISL) is to witness something special. Not special in the “special needs” sense. Just special. Hands moving, faces animated, bodies swaying; it’s a compelling performance, not least because it is effectively bilingual. The girls are signing in time to a backing track of the song with the guidance of the conductor, but they are not signing each and every word of the lyrics. The song has been translated into ISL, a language of the face, hands and body that is very different in structure and grammar to English. (It’s a common misconception that sign languages are based on spoken languages. The national sign languages of other English-speaking countries are all different ). You don’t need to know any ISL to appreciate it, in much the same way that you don’t need to be fluent in Italian to appreciate a performance of Nessun Dorma. This choir has performed for audiences of thousands at several venues around the country, as well as on TV, including RTÉ’s Saturday Night Show. At a concert in Germany last September, accompanied by the world-famous Mahler Chamber Orchestra and a group of backing singers, the group was one of the stars of the concert. It was part of the annual Beethovenfest in Bonn, where the choir performed along with three other signing choirs from Cologne, Prague and Brescia. The choir left a lasting impression on concert organiser Paul Whittaker, a profoundly deaf musician and founder of UK charity Music and the Deaf, when he met them in Dublin this year. The choir members had a great time. “It was a real once-in-a-lifetime opportunity,” says Emma O’Higgins. And Aimee McLoughlin adds that “it was amazing to hear the other languages from the different countries, and to see what their sign was like compared to ours”. When conductor Shirley Higgins started up the choir four years ago, she did not set out to form a “cute deaf choir” but one that would be respected as a choir in its own right. It has since performed at DCU’s Helix, Dublin Castle, Belfast’s Titanic Exhibition Centre and Croke Park. While St Mary’s is blazing a trail in this emerging genre, it’s also clear from Higgins that being in the choir has an educational value for the teenagers on many levels. Not least of these is their “X-factor” confidence: seeing performance as a normal, natural thing, and in front of audiences of thousands. “I have kids who, when they first came here, had no self-esteem, no confidence, and I see them, a year later, full of confidence,” says Higgins. It also adds depth to their musical education and listening skills. Higgins encourages them to listen to and choose the songs they perform, and then gets them listening to the key rhythms, signing them, devising movements, and even setting up signing “harmonies”. As a result, the teenagers say they are listening to music and sharing tunes with each other far more. But it’s not all about English. The choir members also renew their appreciation for ISL. In St Mary’s, sign language has roughly equal status with spoken English as the medium of teaching and communication. Higgins trained for two years at the centre for deaf studies at Trinity College for an ISL teaching qualification, so she is well able to guide the translations of song lyrics from English to ISL. But he adds that some “wannabe” signing choirs have tried to take shortcuts. “I have met quite a lot of signing choirs in schools who have simply watched something on YouTube and copied it. The risk there is that they don’t know whether that signing is actually good. It may not even be the right sign language for the country. The recent success of St Mary’s School for Deaf Girls’ signing choir brought them to the attention of the Mahler Chamber Orchestra, which runs Feel the Music, a project designed to open up classical music to deaf children across Europe. Under the guidance of Paul Whittaker, a profoundly deaf musician who runs the UK charity Music and the Deaf, the Mahler Chamber Orchestra and pianist Leif Ove Andsnes visit children from deaf schools and invite them to hear, feel and play their instruments, including a grand piano, kettle drums, a viola, a cello and an oboe. Feel The Music is part of the Mahler Chamber Orchestra’s Beethoven Journey concert series, which will have visited 40 European cities when it finishes next year. Part of the project examines how Beethoven’s own deafness – which began when he was in his 20s and left his career as a virtuoso pianist in tatters – not only brought him to the brink of despair but greatly influenced his compositions. “Feel the Music has been the most exciting and inspiring project I have done in my 26 years of working at Music and the Deaf,” says Whittaker. “It has shown thousands of people that deaf people can enjoy [and make] music; it’s been a real eye-opener for the Mahler Chamber Orchestra and for Leif Ove Andsnes. proposition seems simple – even compelling – at a time when the tech industry here is crying out for new blood: if you are currently out of a job, want to change career or are desperate to work for an industry that offers more scope for career progression, sign up for an information technology conversion course. Conversion courses to IT have been around for over 10 years, but recently the number has risen sharply after tech companies complained they couldn’t find enough computer science graduates to fill jobs. The Government responded by setting up Springboard and ICT Skills Conversion, two schemes that fund free or heavily subsidised places on conversion courses in IT and other growth areas for unemployed yet skilled professionals in industries that have been hit by recession. On the surface they appear to be working well. A 2014 review by the Higher Education Authority, which runs both schemes, found that 67 per cent of participants were reported to be in employment or self-employment, and another 5 per cent in further study. Some 92 per cent of Springboard participants said they would recommend the scheme. But one specialist IT recruitment firm says the tech sector is still somewhat reluctant to take on conversion graduates. Although Stelfox doesn’t engage in graduate recruitment, its staff sometimes work with candidates they consider very promising, including one young man who had done an IT conversion course at UCD after he had struggled to find work as an architect. He finished top of his class and did all the right things in his job-search strategy, applying to more than 30 companies. He eventually got a good job as a software developer, but Sullivan was surprised at how difficult it was to get interviews for someone they considered a top-notch candidate, and some of the feedback he had got strongly hinted at a heavy bias against conversion graduates. For Mark King, vice-president of engineering at education tech firm Fishtree, doing well in a conversion course would not be enough on its own to secure a programming job. “The reality is that most hiring managers, be they HR folks or engineering managers, would limit the hiring of IT conversion grads to specific roles in the organisation” such as IT support or testing. Dr Mark Roantree, who chairs the graduate diploma in IT at DCU, says firms favouring a four-year degree graduate is to be expected, particularly for programming, which is “top of the tree” in the IT sector. Joe Howley did a HDip IT conversion course at NUI Maynooth in 2001, but a lack of software jobs at the time forced him back into the construction industry. In 2012, he went to DCU to do a MEng in telecoms engineering as a way back into software. “I don’t think I would have found work with just the HDip on its own,” he says. Howley says that more employers are asking candidates to do aptitude tests on specific programming languages and to demonstrate projects they have worked on. “Simply having the academic qualifications, whether it be at Dip, master’s or BSc level, may not be enough for entry-level positions,” he says. Craig Bell, who finished a two-year master’s computer science conversion course at UCD last year, did well in his programming modules but also built a website to showcase a portfolio of programming projects. He did an internship for three months this year at youth charity Spunout.ie, but after that he was unemployed for three months before being recruited in August on to the graduate programme at Realex Payments, an Irish online payment-processing firm that employs 170 people. He now works there as an integration and support analyst. He had been “sending out CVs everywhere” and was required to do aptitude tests as part of several job applications, which he disliked. His application to Realex also included an aptitude test, but “they still took me on because they could see that I had a year’s experience in customer care, customer service, and that I had potential for programming”. Many people say this is a conversion graduate’s trump card: transferable experience and skills from another industry. Although he enjoyed his course at UCD, Bell says it badly needed to have a work placement element. Students on the National College of Ireland’s IT conversion courses get work placements, and the college has managed to get them into a variety of firms as Java developers, web application developers and test engineers, says the college’s careers and opportunities officer, Caroline Kennedy. Most of the work placements offered to students are with small and medium-sized enterprises (SMEs) because they value transferable skills, says Kennedy. Sullivan also believes SMEs are more open-minded about conversion graduates. It was mostly large and medium-sized firms that hired the 2013 graduates of NUI Galway’s higher diploma in software design and development, including Sarah Kennedy, who now works as a software developer for Galway-based Storm Technology, which employs 80 people. Most of the graduates she kept in touch with got their jobs through work placements. Kevin O’Shaughnessy, chief executive of travel software firm Indigo, which employs 15, has not yet hired a conversion graduate, but he has interviewed a few and is open-minded.“We demand very flexible, multidisciplinary staff, and I think that’s where the conversion courses may appeal. The Better Options fair in Dublin aims to be a one-stop shop for would-be students with disabilities, with all the information they need about facilities, supports and navigating a path to a college of their choice. Finding out about the options for third-level study can be a hugely interesting, stimulating and even enjoyable experience for most secondary-school students. But for those with disabilities or from disadvantaged backgrounds, it can be a much more daunting prospect, driven by a range of anxieties, including whether they can even gain entry in the first place or get the appropriate supports they need to complete a course successfully. The good news is that the Irish third-level sector has long acknowledged these concerns and works hard to give these students every opportunity to pursue an ambition to go to college. In fact, these efforts provided a lifeline to me as far back as 1991. When I applied to the CAO early that year, I was invited by my first choice college, DCU, to take an interview and aptitude test as part of a direct-admission scheme it offered to students with disabilities and mature students. Following disappointing A-level results later that summer, which I was certain would rule me out of admission to the college’s communications studies course (not to mention most of my other choices), I was shocked and delighted to receive a letter offering me a place on the back of that direct-admission scheme. That was my ticket to three fantastic years at DCU, shared with what turned out to be a highly diverse student body, which included several people from the nearby Ballymun area as well as a number of other students with disabilities. Perhaps some might regard the admission processes available to students like me 25 years ago as a little arbitrary or unsystematic, but the reality today is that these processes are much more formal and standardised across most of the third-level sector. Information is also a bit easier to come by. For example, one unmissable event is the Better Options fair at the National College of Ireland campus on November 24th. Run by the Association for Higher Education Access and Disability (Ahead), it aims to provide a one-stop shop, supplying all the information a would-be student with a disability needs to navigate a path to the college of their choice. “It’s a really good forum for parents and guidance counsellors and students to come up and just get their questions answered,” says Ahead’s executive director, Ann Heelan. In some ways it’s an alternative to attending a larger event, such as Higher Options at the RDS, which may be “too crowded for someone with a disability”, she adds. “It’s to give students and their parents information about how accessible the colleges are for disabilities, for supports they can get if they go, and the fact that all of the student disciplines and courses are open to them. There will also be information on accessible campus accommodation for those with physical disabilities. “It’s very reassuring for parents sending their young children with a disability away from home, while students have come back to us and they’ve said to us, ‘I actually made a decision on that day to go to college’. Maybe they weren’t sure before,” Heelan says. The website of Ahead also has a lot of useful general information about what types of supports are available, and staff are on hand to answer any specific questions. It doesn’t have data that enables people to compare colleges in terms of the supports they can provide, which means that contacting disability support officers is an important step in the information-gathering process. All the main colleges and universities will have stands at Better Options, run by their disability support staff, along with those who administer the Disability Access Route to Education (Dare) scheme. This scheme, along with the Higher Education Access Route (Hear), allows colleges to add additional CAO points to an applicant’s Leaving Cert as long as they meet the criteria for being classified as either economically disadvantaged (Hear) or having a diagnosed disability (Dare). Both schemes have been operating in some form for a while, but are now a formal part of the CAO process, which kicks in once you tick the box on the CAO application form to say you have a disability or are from a disadvantaged background. The Dare scheme, in particular, can trace its roots back to supplementary admission schemes such as those run by DCU 25 years ago. Dare has also been influenced by the work of Ahead, which celebrated its 25th anniversary last year. Over time, changes have been made to the Dare criteria, to make them more transparent as the number of students applying to the scheme continues to rise (there were 9,000 applications to Dare last year), but this has reportedly led to some problems. The Irish Times Leaving Cert Results Helpdesk also received a number of queries last August from parents and students concerned about how the Dare criteria were being applied. “I’ve heard reports of somebody who was deaf in one ear but not the other ear, who struggled in school, and it had an impact, but wasn’t eligible for Dare,” says Heelan. The Irish Universities Association (IUA), which recently took over the running of the Dare scheme (along with Hear), is understood to be reviewing the criteria. However, Heelan concedes that Dare is better and fairer in a number of ways compared to the old individual supplementary-admission schemes, particularly in light of the high volume of applications it receives. One of the biggest advantages is that it reduces duplication, as students can apply to many different colleges but only need to go through the Dare process once. “I can see why they set up Dare. The problem is it’s implemented very rigidly. And I think in any system, if you’re very rigid and you’re not looking at any grey areas, you’re going to exclude certain people,” says Heelan. While all seven universities and 10 other colleges now use the Dare scheme, some other colleges, such as Galway-Mayo Institute of Technology and the Institute of Technology Tallaght, operate their own supplementary-admission schemes. Their criteria may be different, and possibly more flexible, than for colleges operating Dare, or they may be very similar. The only way to find out is to contact the colleges directly. Other colleges, including private colleges, may not operate any supplementary admission for students with disabilities, although they would still offer supports to students who gain admission, perhaps with technical assistance and exams. Growing up with four older brothers who all went to college, and then seeing them graduate in their robes and caps, was all the motivation Maeve Dermody needed to pursue third-level education. “I suppose, as well, my parents saying that I would go to college after my Leaving Cert meant that was always going to be the plan anyway,” she says. Dermody’s initial desire was to be a primary-school teacher but she discovered in her transition year that Irish was compulsory for teacher training college. As she is deaf and went to a deaf school, this wasn’t a realistic goal. So she explored other options, and went to various college open days, though in the end the biggest influence on her future was a school trip organised by DCU’s disability officer. “When I was studying for my Leaving Cert, I found I had a passion for accounting, so when I saw DCU had the accounting and finance degree course, I decided to apply for it as my first choice,” she says. Her results put her 40 points behind the DCU requirement for the accounting course, but through the concessionary points facilitated by the Dare scheme, she was able to get a place. It wasn’t until after she got her place at DCU that she discovered more about the supports available, after attending a two-day workshop. This set-up was reviewed after some difficulties in her first year, and after further discussions with the disability officer, she decided to change from a note-taker to a stenographer and “never looked back”. After graduating in 2012, Dermody went on to do an MSc in education and is now a qualified secondary-school teacher, specialising in business studies and accounting. She is also studying for chartered accountancy qualifications. Mark Ryan, a marketing graduate from Cobh, Co Cork, who has dyslexia and dyspraxia, found out too late that he had more options than he thought. His Leaving Cert points were high enough get him into University College Cork in 2009, but he didn’t apply there because he had been told that, due to his exemption from the Irish exam (because of dyslexia), he couldn’t go to any of the universities. These included a note-taker, three hours of free grinds per week, and supports for doing exams. Some of these supports were the same as ones he received at school, making the transition from second to third level much easier. Ryan recommends seeking out information from colleges in advance, particularly from the disability support officers, to “get a feeling for what supports are there”, as some places may be better than others. “It’s that support which makes the difference between graduating with a first-class honours and just scraping through college,” he says. Ryan also recommends speaking, where possible, to current and former students, who can often make the information from the disability support officers more three-dimensional. While at CIT, Ryan gave speeches about his experiences at disability support workshops in local schools.